Albizia schimperiana is widespread, from eastern DR Congo, southern Sudan and Ethiopia, south to Zimbabwe and Mozambique. The wood of Albizia schimperiana is used for construction, joinery, tool handles, beehives, stools, grain mortars, spoons, needles, plywood and matchboxes. It also serves as firewood and for charcoal production. Albizia schimperiana is planted in agroforestry systems as a shade tree and for soil conservation and improvement. It is browsed by cattle and branches are lopped and fed to goats. Reports of its forage value range from poor to fair. The flowers serve as a source of nectar for honeybees. In Kenya a root infusion added to porridge is used against headache and other pains. The stem bark is used in Tanzania to treat warts. The bark is used as a cough remedy and as a soap substitute, while the ash of the bark is added to snuff tobacco to give pungency. In Ethiopia ground seeds mixed with water are used as an insecticide. Wool can be coloured yellow with the leaves. There are no trade statistics for Albizia schimperiana timber, but it has recently been included in commercial trade from the East Usambara Mountains in Tanzania. The wood is fairly strong, works easily and is not resistant to termites. Leaves and twigs harvested from mature trees at the end of the rainy season contained 25.6 g crude protein per 100 g dry matter, but the digestibility is rather low. 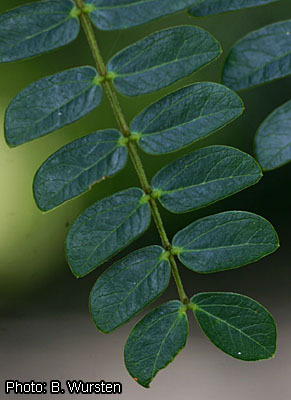 Spermine alkaloids and several triterpenes (lupeol, lupenone, oleanoic acid and hederagenin) have been isolated from the bark of Albizia schimperiana. Medium-sized deciduous tree up to 30(–35) m tall; bole straight and cylindrical or low-branched, up to 70 cm in diameter; bark surface grey or brown, smooth or rough; crown flattened or rounded, often umbrella-shaped; young twigs brown pubescent. Leaves alternate, bipinnately compound with (1–)2–7(–11) pairs of pinnae; stipules awl-shaped, caducous; petiole near the base of upper side with a sessile gland, rachis densely to sparsely pubescent; leaflets in 6–21(–23) pairs per pinna, almost sessile, obliquely rhombic or oblong, up to 2(–3) cm × 1(–1.5) cm, rounded to acute at apex, pubescent below. Inflorescence an axillary head on 2.5–5 cm long peduncle. Flowers bisexual, regular, 5-merous, white or pale yellow; pedicel 1–6 mm long, brown pubescent; calyx 1.5–2.5 mm long, with long tube toothed at apex, brown or sometimes grey pubescent outside; corolla 3–7.5 mm long, brown or sometimes grey pubescent outside; stamens numerous, 7–12 mm long, united at base, with creamy white filaments; ovary superior, gradually tapering into slender style. Fruit an oblong, flat pod 15–34 cm × 2–6 cm, with 1.5–2 cm long stipe, shortly pubescent, transversely veined, dull brown when ripe, tardily dehiscent or indehiscent, c. 8-seeded. Seeds flattened globose to ellipsoid, 9–11 mm × 6.5–8 mm. Albizia comprises about 120 species and occurs throughout the tropics. Approximately 35 species are found in continental Africa and about 30 in Madagascar. It is characterized by the head-like inflorescence, with 1–2 central flowers modified, functionally male and having a larger, nectar-producing staminal tube. Molecular analyses showed that Albizia is heterogeneous, and a revision of the genus is needed. Albizia schimperiana is variable, especially in leaf characteristics and indumentum colour. Three varieties have been distinguished: var. schimperiana occurring throughout the range of the species, var. amaniensis (Baker f.) Brenan characterized by few leaflets per pinna with the terminal pair largest and restricted to Tanzania, and var. tephrocalyx Brenan characterized by the grey colour of the hairs on calyx and corolla and occurring in southern Sudan and Uganda. Albizia schimperiana trees grow slowly. The roots develop nitrogen-fixing nodules containing Bradyrhizobium bacteria. Albizia schimperiana trees live in association with arbuscular mycorrhizae. Flowering occurs at the end of the dry season; pods take about 5 months to mature. The pods tend not to split open and therefore rot on the ground. 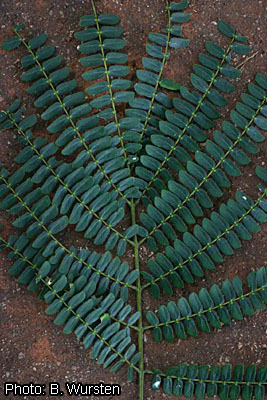 Albizia amara (Roxb.) Boivin (bitter albizia) resembles Albizia schimperiana, but differs in smaller leaflets and shorter pedicels. It is a shrub or small tree up to 15 m tall, occurring from Eritrea and Ethiopia south to northern South Africa, and in India and Sri Lanka. Its wood is used for poles and implements, and as firewood and for charcoal production. 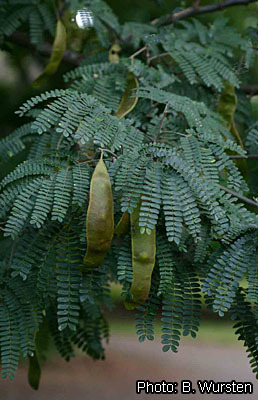 Tests in Tanzania showed that Albizia amara could be promoted for commercial utilization for furniture and construction. It is also planted for soil improvement and conservation, its foliage is used as fodder, and its roots, leaves and pods are used in traditional medicine. A root infusion is drunk to treat pneumonia, tuberculosis, infertility of women and as an aphrodisiac, whereas roots are applied externally to warts and against uterus complaints. The bark is used to treat jaundice and mouth inflammations, the leaves for the treatment of diarrhoea, oedema and wounds, and the pods as an emetic and for the treatment of cough and malaria. The roots are also used as a soap substitute. Albizia harveyi E.Fourn. also differs from Albizia schimperiana by its smaller leaflets and shorter pedicels, and from Albizia amara by its leaflets, which are acute and asymmetrical at apex in Albizia harveyi and obtuse and symmetrical at apex in Albizia amara. It is a small tree up to 15 m tall and occurs from Kenya south to northern South Africa. Its wood is used for building poles and as firewood. In Tanzania the roots are used to treat epilepsy, cystitis, vomiting, infertility and to prevent miscarriage. The foliage is browsed by livestock. Albizia forbesii Benth., occurring from Tanzania south to South Africa, also resembles Albizia schimperiana, but is characterized by its sessile flowers with larger calyx and narrower seeds. Its wood is used in southern Africa for posts of native houses. Albizia schimperiana occurs in upland forest and evergreen bushland at 900–2600 m altitude. It may be dominant in the upper canopy in southern Sudan and Ethiopia. In Tanzania it grows in regions with a mean annual temperature of 14–20°C and an annual rainfall of at least 1000 mm, often in open secondary forest and montane riparian forest. Albizia schimperiana is capable of regeneration in more or less closed forest, with seedlings surviving in the shade. The seeds are often damaged by insects. Methods have been developed to separate sound and damaged seeds using near infrared spectroscopy. The 1000-seed weight is 90–125 g. Mechanical scarification as well as treatment with sulphuric acid or hot water (boiling or 75°C) are effective ways of overcoming seed coat induced dormancy. Seedlings may be planted out after 4 months in the nursery. Wildlings are sometimes collected from the forest for planting. Planting in pure stands is not recommended because of the greater risk of pest problems. Planted trees can be managed by coppicing. Albizia schimperiana is widespread and locally common, and not threatened by genetic erosion. However, locally populations are under great pressure because of deforestation and poor regeneration, e.g. in Ethiopia. Although Albizia schimperiana is a slow-growing tree, it is locally preferred in traditional agroforestry systems, e.g. in Ethiopia and in the West Usambara Mountains in Tanzania. It is locally a highly valued multipurpose tree. Little is known about many aspects of this tree, and research is needed to evaluate its potential role as a timber and agroforestry tree on a wider scale. Lovett, J.C., Ruffo, C.K., Gereau, R.E. & Taplin, J.R.D., 2006. Field guide to the moist forest trees of Tanzania. [Internet] Centre for Ecology Law and Policy, Environment Department, University of York, York, United Kingdom. http://www.york.ac.uk/res/celp/webpages/projects/ecology/tree%20guide/guide.htm. February 2007. Lemmens, R.H.M.J., 2007. Albizia schimperiana Oliv. In: Louppe, D., Oteng-Amoako, A.A. & Brink, M. (Editors). PROTA (Plant Resources of Tropical Africa / Ressources végétales de l’Afrique tropicale), Wageningen, Netherlands. Accessed 14 April 2019. This page was last modified on 19 March 2017, at 16:50.